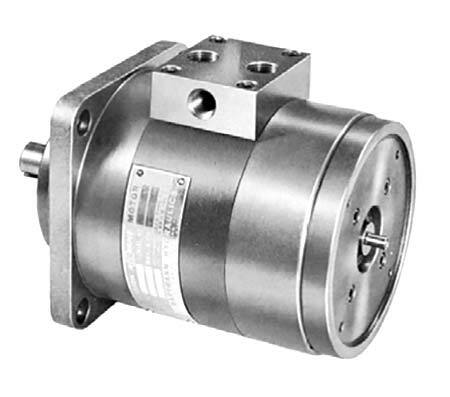 A Strong Performance Servo Motor, Instant Reversibility and Precise Low Speed Operation Qualifies Hartmann as a Unique Motor. Hartmann Rol-Vane Hydraulic Motor is an efficient and compact means of applying variable speed rotary hydraulic power and instant reversibility. Optimum Rotary Rigidity is achieved through use of a one-piece shaft-rotor assembly. Constant Velocity of Rotating Elements – Absence of reciprocating and cam-operated parts reduces wear and its associated problems. Uniformly Free Rotation through its entire speed range is made possible by the motor’s unique pressure balancing system which eliminates hydraulic loading and pressure locks. Minimum Breakaway Pressure of 10 to 20 psi means high breakout torque efficiency. High Volumetric Efficiency through use of precisely machined hardened steel rolling vanes which act as non-wearing valving mechanisms. High Mechanical Efficiency is the result of close tolerance design and high degrees of finish. Wide-Speed Range – Infinite speed variation can be had from a single motor, from a fraction of an rpm through full rated speed. Quiet Operation makes the Rol-Vane motor ideal for use where low noise level is a must.